When you need a new fence installed, you essentially have two options: You can do it yourself, or, you can hire professional fence contractors in Ontario to do all the work for you. Even if you are experienced in building, it’s a good idea to hire a fence company within the Greater Toronto Area (GTA) to help. There are many advantage that a professional brings over you having to undertake responsibility for an entire project. For DIY, all planning is 100% on your shoulders. You must source all the building materials, tools, and make all the decisions. Make sure to check with your local municipality so that you are appraised of building codes, and whether you need a permit issued. For instance, Toronto has fence standards that need to be followed; every location has different codes, restrictions, and standards that you will have to learn by yourself, unless you contract an expert for help. 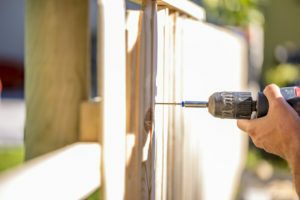 The time it takes to build your fence will hinge upon several factors including the type of fence that you are installing, as well as how much experience you have with carpentry and digging. Many have begun projects only to discover themselves mired in unforeseen headaches and delays along the way. Ultimately, hiring a fence company saves your time. Theoretically, a DIY job is cheaper. This holds true for fencing situations where you know all aspects of the job. This includes buying just enough materials, budgeting your time, and knowing where to dig. However, a professional fence contractor saves you from any additional costs you may incur from having to redo the work if you don’t get it right the first time. The truth about any type of improvement project is that there is always a danger that you will have an accident. That’s why you should always use proper safety gear, and make sure you lift items using techniques that won’t place excessive strain on your back. Professional fence contractors, however, are well-versed in safety while working on the job. Furthermore, a professional fencing company undertakes all of the dangerous parts. Remember that a company that spends all of its time designing, installing, and maintaining fences has the experience to provide superior workmanship. Professionals have better tools and skills than most others can muster. A professional has done it time and time again—and can give you an elegantly-designed fence while saving you from needing to invest as much effort. Without any doubt, hiring professional contracts is an ideal solution because a team of fencing experts can construct your fence in a fraction of the time it would take to do it yourself. They can handle unexpected challenges with speed and dexterity in order to keep your project on track. Furthermore, you are in total control of the design and can get your fence built to the specifications and quality that you demand. Are you located in Ontario and looking for a reliable company to help build your fence? Total Fence Inc. is a fully licensed company located in Toronto. We provide a myriad of beautiful fence options, and best of all, we do all the work for you. Want to know more? Feel free to contact us with any questions.